What common mistakes can I avoid? How much can I spend now? Should I invest all of the inheritance? Are there any inheritance taxes due, or any tax advantages to passing it on to my children? Are estate plans up to date and tailored to our unique situation? Do I need to completely rethink my financial planning? Whether it came as a surprise or you were planning for it all along, managing an inheritance is a financial difference maker. While the money can seem like a good thing, it also brings a host of complexities that need to be navigated ­– who the beneficiaries are, what taxes are required, how to accommodate it within your financial plan. Working with an advisor who knows how to navigate all of the intricacies that an inheritance brings with it paves the way for fewer problems and a smoother accommodation into your financial picture. According to research, 70% of wealthy families lose their wealth within two generations, and 90% lose it within three. Because younger generations may lack sufficient financial education, communication among generations is critical – ideally, before the inheritance occurs. An inheritance can bring greater financial obligations, including higher taxes. Knowing what you can spend, how much and how to invest, and if debts are paid off is key to long-term financial success. Furthermore, for those planning an inheritance, it is crucial to make sure estate plans are up to date and designed to your unique needs, goals and circumstances. Having a set estate plan can also ease the burden of emotional stress on all parties involved. Open communication and planning leads to better inheritance management that can ensure that future generations enjoy the same benefits. 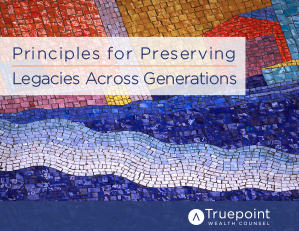 Truepoint’s integrated approach brings together specialists in tax management, financial planning, risk management and estate planning to give you a holistic plan and “big-picture” views of critical financial issues – including managing inheritances. Further, we help you think through the big decisions and manage the critical details of your financial life. As fiduciaries, we are solely focused on what is best for you. Easy access to an integrated team of specialists also means you don’t have to be the “middle man” and coordinate multiple advisors. It’s a different approach from other wealth advisors, but one that’s designed for a better experience, personal service and outstanding returns. Contact a Truepoint Wealth advisor today to begin talking about how we can help you manage your inheritance.